Retailers are beginning to embrace RFID in-store with a view to transforming stock accuracy. But, while great, there are potentially some even greater benefits of deploying RFID. Firstly, real-time tracking enables retailers to gain unprecedented insight into the way customers interact with products in-store. Secondly, and even more importantly, by feeding highly accurate store-level inventory data into an end to end order management system, retailers can transform both the customer experience and inventory utilisation, explains Craig Summers, Managing Director UK, Manhattan Associates. Radio Frequency ID (RFID) technology is finally set to hit the mainstream. With costs dropping, growing numbers of retailers are looking to explore this real-time tracking solution not only in the warehouse but also in–store, to radically improve inventory management. In addition to the lower costs of RFID tags, new ultra–high frequency readers can capture inventory data in real–time, releasing employees from using handheld readers. As a result, the ROI for RFID instore is already compelling: retailers are reporting accuracy rising from 60% to 90%, reductions in shrinkage, plus a chance to reassign shop staff to far more valuable, customer-facing activities. But, while important, RFID offers far more than improved instore inventory accuracy: it provides the missing link in understanding customer behaviour, and when combined with an order management solution, it allows retailers to radically improve the service experience for the customer. At a tracking level, in addition to the obvious basket information, RFID can reveal which products are repeatedly picked up but never actually purchased; which items are taken to the changing rooms but always left there; and which are never even noticed. This level of information is even more compelling than tracking customers’ online behaviour because it adds the physical touch, see, experience aspect. It can be combined with other data – such as information from cameras or motion detectors – to provide information on customer traffic patterns. It can even be linked to individual customers, via instore Wi-Fi and apps, for those that sign in. 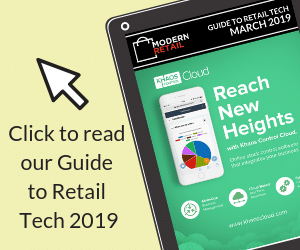 In addition to plugging that gap in data on customers’ in-store activity, using RFID in this way can provide retailers with early insight into potential product demand or quality issues that are likely to impact online activity. A product that is repeatedly taken to the changing room but never purchased, for example, is likely to be one that is often bought online but experiences high levels of return. The key to unlocking even greater value though is in combining this rich information – an accurate picture of store inventory and data on how customers are interacting with products – with an end to end order management system. Retailers suddenly become equipped with the tools that allow them to take far more proactive and effective inventory allocation and service enhancement decisions. The technology combination allows them to quickly spot a trend in demand within one location and move stock between stores in response. They gain a huge degree of flexibility in terms of how orders can be fulfilled, e.g. in-store stock can be reserved to fulfil click-and-collect orders or can be used to support a 2-hour delivery service with a ship-from-store fulfilment capability. And with visibility of every stock unit across the network, they can present a customer with a much broader range of fulfilment options where a product is not available in a given store and essentially “save the sale”. Critically, the order management system automatically weighs up every fulfilment option and simultaneously considers product performance, geographic implications, financial costs, operational costs, and customer satisfaction impact to always choose the most profitable option to meet the customer promise. The use of RFID alongside an order management system can enable the most effective allocation of stock across the business in response to actual customer demand, in turn improving service levels, driving sales revenue and boosting profitability. The combined RFID/order management system approach is likely to take retail instore by storm in 2018. But those retailers only considering RFID as a tool to improve inventory accuracy are missing a trick. After a decade of tracking every customer interaction online to improve both sales and the customer experience, RFID alongside order management technology now offers the chance to do the same instore as well as synchronise inventory and transaction data across channels. The combination provides the complete insight into both product and customer, and enables a retailer to deliver the right product at the right time – profitably, and create the ultimate in customer experience.